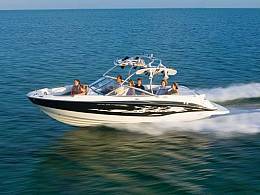 The 225 is the newest, largest runabout featuring Bayliner's next generation of design. Beyond sleek style, the 225 offers increased sensible storage, an expansive cockpit with wraparound seating, and a totally redesigned transom, with an available "Transom Tunes" stereo option. A standard V8 engine rounds out this powerful package.